Though I'm a travel writer, I had yet to visit Chicago before my recent trip, and, in general, knew very little about the Windy City. In my head, I pictured it as a lively metropolis, known for the Chicago Cubs, deep dish pizza and a rich history filled with crime and second chances. Luckily, I have friends that live in Chicago that were excited to give me a non-touristy view of the tourist attractions on my recent trip...by bike! Chi-Town is comprised of many neighborhoods from Lincoln Park and River North to Chinatown and Wicker Park, so what better way to explore the city than by two wheels? It’s a fast and easy way of maneuvering through the neighborhoods while discovering new areas to sightsee. First of all, we had to pick up our bicycles! My friends recommended renting Schwinn bikes from Bobby’s Bike Hike near Lake Shore Drive, which rents road bikes and hybrids. Schwinn was founded in Chicago in 1895, so it was exciting to learn the history of Chicago as a cycling city. Bobby’s Bike Hike is located in the bustling downtown neighborhood and is in close proximity to the beautiful paths that run along the Lake Michigan shoreline. They arm you with a helmet, a bike lock and a bike map of Chicago that highlights the most bike-friendly streets. You can reserve a Schwinn bike online before your trip. After picking up our Schwinn bikes, we started our day by riding through downtown’s famous Millennium Park in The Loop, which is just a few minutes from Bobby’s Bike Hike. It’s a gorgeous park by the Chicago River where you can peruse public art, lounge on a lawn for a picnic or even take in a free concert. Then, I checked off a few destinations in the park on my must-see list, including the Cloud Gate, or “The Bean” as Chicagoans have dubbed it: A large legume-shaped sculpture that distorts your reflection. Also on my list was the Art Institute of Chicago, which encompasses a museum with thousands of famed works by artists like Pablo Picasso and Georgia O’Keeffe. Chicago is built on history and stunning architecture, so next up was a five-minute cycle to board the Chicago Architecture Foundation River Cruise aboard Chicago's First Lady Cruises. It was highly recommended by my friends and trusted tour guides, as a touristy non-tourist must stop. My friends even take the tour once a year to learn about all of the new structures that are being built on the river. You’ll relax on a boat and see the cityscape, while a tour guide walks you through the names of celebrated architects, humorous Chicago gossip and of course the story behind the notorious Great Chicago Fire of 1871. After the boat cruise, we took another quick bike ride north in order to see Chi-Town from 1,000 feet in the air at 360 CHICAGO, the historic John Hancock Center in the heart of downtown Chicago. 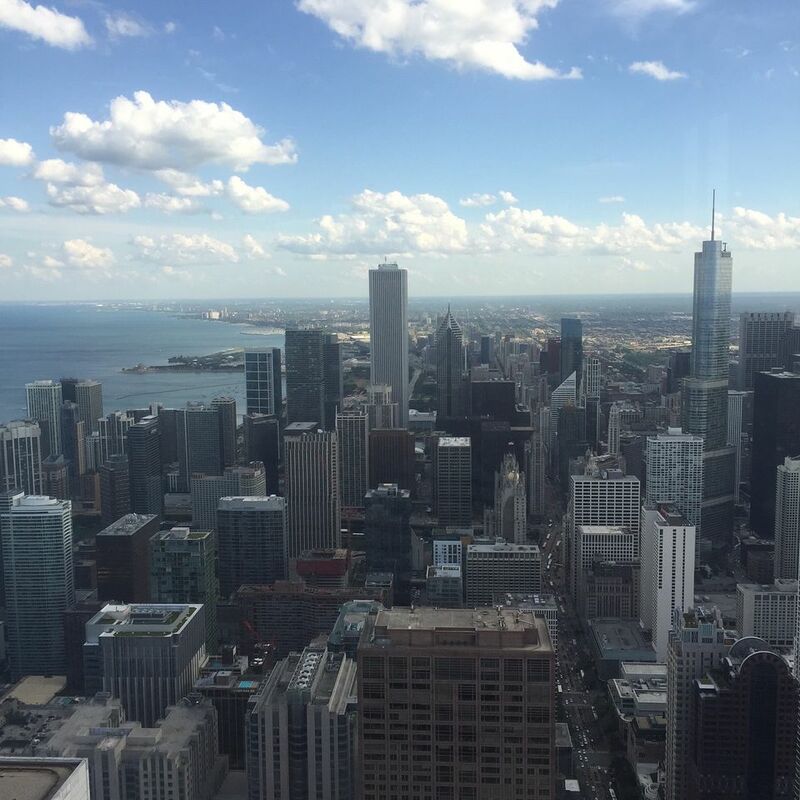 I was able to see breathtaking views of the city and Lake Michigan while enjoying a drink at the cafe. If you’re feeling daring, try the TILT – a thrilling one-of-a-kind attraction that literally tilt's you to a 30° angle over Michigan Avenue. Hello, sweaty palms! As in any great city, there are massive amounts of delicious restaurants to explore. And there’s really no better way to restaurant hop than by bike! Big Star was highly recommended as a fun outdoor hangout that served up delicious tacos, which we soon confirmed ourselves after riding over. We rode partially on the 606, the High Line of Chicago, which used to be an abandoned rail line that was recently converted into a 2.7-mile recreational trail above the city. We also rode our Schwinn’s along this path on the way home and enjoyed the art sculptures and beautiful views of the city from up above.